Ingres’s Inferno: Reading Paolo and Francesca. My thesis reads Jean-Auguste-Dominique Ingres’s 1819 Paolo and Francesca against its literary source, canto 5 of Dante’s Inferno, to learn both how the artist interpreted this text and how his own cultural context informed that interpretation. Chapter 1 explores how Ingres transformed Dante’s canto into a painting. Thematic interpretation and close reading of the text and formal analysis of the painting are my primary tools. I also parse the painting’s narrative strategies—for example, how pose, gesture, and facial expression can convey intentions, feelings, and relationships, how point-of-view can direct a viewer’s attention and sympathies, and how light, color, and form can be used to express a character’s inner state. When outside influences are discussed—for example, John Flaxman’s line drawings—they serve as counterpoints to Ingres’s painting, furthering the argument that his interpretation of Dante was unique and insightful. My conclusions in this chapter are of the kind to be expected: they shed what light they can on Ingres and Paolo and Francesca, and they propose a relatively simple relationship between the painting and the poem. Though small in scope, I think controlled studies such as this can result in deeper understandings of the works under comparison and, in this case, may actually reveal nuances in Ingres’s thinking not easily recognized by other approaches. After this hermetic analysis, I attempt in chapter 2 to identify the cultural factors that shaped Ingres’s painting. In this chapter, I make the case that Ingres’s primary divergences from canto 5 were in part the result of the cultural climate in which he lived, which lacked sensitivity to the poem’s medieval Catholic morality. Here, along with thematic interpretation and formal analysis, I also bring a variety of cultural evidence to bear: eighteenth- and nineteenth-century French literary criticism, Dante reception history, and the tenets of Romanticism. 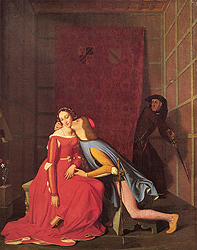 Again, Ingres’s work is compared to other depictions of the Francesca scene, this time as evidence that Francesca’s story was a cultural product invested with its own set of characteristics and meanings. Whether or not Ingres deliberately conformed to his culture’s interpretation is, of course, impossible to determine. Thus, my conclusions in this chapter reveal more about the way nineteenth-century France processed Dante’s Inferno and Francesca da Rimini’s story than they do about Ingres and his painting. Jennifer Poggiali graduated in the summer of 2010 from Pratt’s dual-degree program in Art History and Library and Information Science. She read the first chapter of her thesis, part of which will be presented at today’s event, at Iowa University’s 2010 Graduate Art History Symposium, Art & Text. She has worked for five years as Web Content Manager at Lincoln Center Institute, an arts and education organization at Lincoln Center. In fall 2011 she will begin a new position as the Instructional Technology Librarian at Lehman College. Jennifer wishes to thank her advisor Prof. Morton for her assistance in developing this paper. The 10th Annual Master’s Thesis Presentations will be held on Wednesday, April 13, 2011 at 5pm in Myrtle Hall, 4E-3, Pratt Institute.